^ 交通部中央氣象局. 颱風百問——颱風是怎麼命名？. [2015-07-30]. （原始内容存档于2016-05-31）. ^ Hernandez, Maria. What does 'Soudelor' mean?. Pacific Daily News. 2015-08-01 [2016-07-08]. ^ High Seas Forecast. Japan Meteorological Agency. 2015-07-29 [2015-08-10]. （原始内容存档于2015-07-30）. ^ Tropical Depresion 13W (Thirteen) Warning Nr 001. Joint Typhoon Warning Center (United States Navy). 2015-07-30 [2015-08-10]. （原始内容存档于2015-07-30）. ^ Prognostic Reasoning for Tropical Storm 13W (Soudelor) Warning Nr 10. Joint Typhoon Warning Center (United States Navy). 2015-08-01 [2015-08-10]. （原始内容存档于2015-08-01）. ^ Prognostic Reasoning for Tropical Storm 13W (Soudelor) Warning Nr 09. Joint Typhoon Warning Center (United States Navy). 2015-08-01 [2015-08-10]. （原始内容存档于2015-08-01）. ^ RSMC Tropical Cyclone Advisory. Japan Meteorological Agency. 2015-08-01 [2015-08-10]. （原始内容存档于2015-08-02）. ^ RSMC Tropical Cyclone Advisory. Japan Meteorological Agency. 2015-08-02 [2015-08-10]. （原始内容存档于2015-08-02）. ^ Typhoon 13W (Soudelor) Warning Nr 013. Joint Typhoon Warning Center (United States Navy). 2015-08-02 [2015-08-10]. （原始内容存档于2015-08-02）. ^ Bob Henson. Invest 95L Drenches Florida’s West Coast; Super Typhoon Soudelor Threatens Taiwan. Weather Underground. 2015-08-03 [2015-08-04]. ^ Super Typhoon Soudelor, Earth's Strongest Cyclone of 2015, Moving Toward Taiwan, China, Japan's Ryukyu Islands. The Weather Channel. 2015-08-04 [2015-08-04]. ^ Typhoon Hanna enters PAR, maintains peak strength overnight - Pagasa. InterAksyon.com. （原始内容存档于2015年9月24日）. ^ 海上陸上颱風警報第15報. Central Weather Bureau. [2015-08-07]. （原始内容存档于2015-08-07）. ^ 海上陸上颱風警報第17-1報. Central Weather Bureau. [2015-08-08]. （原始内容存档于2015-08-08）. ^ 台风"苏迪罗"登陆福建 9省市将现强风暴雨. Phoenix New Media. [2015-08-08]. ^ Clynt Ridgell. Typhoon Soudelor Slams Saipan. Pacific News Center. 2015-08-03 [2015-08-04]. ^ Saipan: Restoring essential services could take a month. 阿加尼亚: Washington Times. Associated Press. 2015-08-05 [2015-08-05]. ^ CNMI count costs for Soudelor damage. Radio New Zealand International. Radio New Zealand International. [2015-08-05]. ^ 39.0 39.1 風の状況. 国土交通省気象庁. ^ 交通部中央氣象局. 交通部中央氣象局颱風警報單：2015年第13號　海上颱風警報（第1報）. 2015-08-06. ^ 交通部中央氣象局. 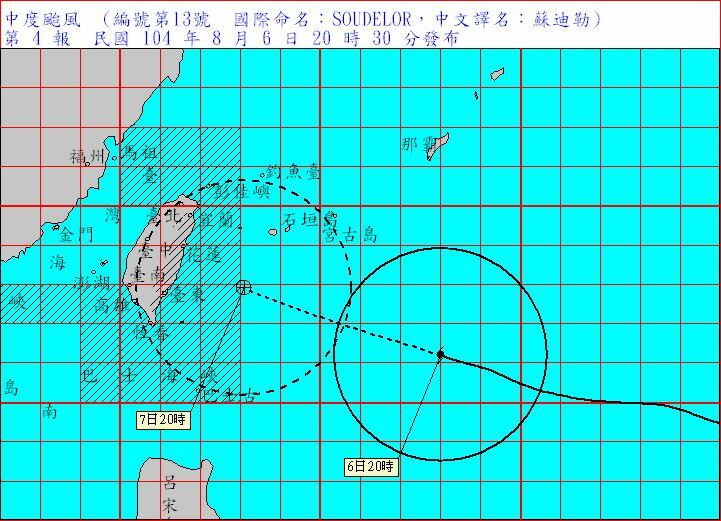 交通部中央氣象局颱風警報單：2015年第13號　海上陸上颱風警報（第4報）. 2015-08-06. ^ 葉子綱. 花蓮災情：3千人安置、1萬多戶停電. 蘋果日報. 2015-08-08 （中文（台灣）‎）. ^ 颱風過境 雲林縣風雨增強肆虐. 中央社. 2015-08-08 [2015-08-10] （中文（台灣）‎）. ^ 蔡文居. 蘇迪勒中心出海引西南氣流 對中南部威脅才剛開始. 自由時報. 2015-08-08 （中文（台灣）‎）. ^ 蘇迪勒出海引進強西南氣流　彭啟明：中南部需嚴防豪雨. ETtoday　東森新聞雲. 2015-08-08 （中文（台灣）‎）. ^ 史上最嚴重颱風停電 393萬戶停電 上看400萬. 2015-08-08. ^ 內政部消防署. 蘇迪勒颱風人命傷亡及一般災情. 2015-08-08 [2015-08-08]. （原始内容存档于2015-09-28）. ^ 烏來2千居民受困 百人失聯. 蘋果日報. 2015-08-10 [2015-08-10] （中文（台灣）‎）. ^ 50.0 50.1 桃園羅浮合流部落遭土石流淹沒 幸提前撤離. 聯合報. 2015-08-09 [2015-08-10] （中文（台灣）‎）. ^ 記者林昭彰／新北報導. 泥流吞一樓 三峽有木里居民「60年沒碰過」. 聯合報. 2015-08-11 [2015-08-12] （中文（台灣）‎）. ^ 記者陳韋宗／新北報導. 板橋湳仔溪水暴漲 路旁小客車泡水. 自由電子報. 2015-08-08 [2015-08-12] （中文（台灣）‎）. ^ 台北300萬人喝泥水. 蘋果日報. 2015-08-10 [2015-08-10] （中文（台灣）‎）. ^ 颱風蘇迪勒樹倒災情 北市歷年最慘. 中央社. 2015-08-08 [2015-08-10] （中文（台灣）‎）. ^ 黃文鍠. 台南女中人權象徵 「丁窈窕」金龜樹倒地. 自由時報. 2015-08-10 [2015-08-10] （中文（台灣）‎）. ^ 104年8月蘇迪勒颱風農業災情報告. 行政院農業委員會. 2015-08-12 [2015-08-13]. ^ 74.0 74.1 中央氣象局 颱風警報單. ^ 中国气象局. 今年第13號颱風“蘇迪羅”深入內陸影響結束 11個省（市）受影響. [2015-08-11]. ^ 溫州网. 受“苏迪罗”影响 温州48小时降雨量最高751.9mm. [2015-08-09]. ^ 新浪网. 登陆闽影响温州的台风 近10年就数苏迪罗最凶狠. [2015-08-13]. ^ 温州日报. “苏迪罗”致温州12人死亡 直接经济损失38亿元. [2015-08-09]. ^ 中国文成网. 全县33个路段发生塌方或泥石流 目前道路基本抢通. [2015-08-09].